Most of us know that Agatha Christie is famous all over the world for her suspense thriller/murder mystery novels. Agatha Christie's books have sold over one billion copies all over the world .It is her sharp observation of people's ambitions,relationships and conflicts that added life to her ingenious detective thrillers . However, not many know that she has also written a few books in the name of Mary Westmacott - Bitter Sweet novels , deals with what she calls crimes of the heart !.Here she has used her understanding of human nature on a different level , based on more intimate relationships ,love stories with jagged edges and sparkling life experiences that make compelling reading that is as memorable as her suspense thrillers. I happened to read one recently called ' Absent in the spring ' and found it every bit as interesting and absorbing as her other novels on crime.In fact, I have now decided to read all 6 of her writings on crimes of the heart ! It deals with emotions and basic understanding of human nature as I already mentioned earlier . 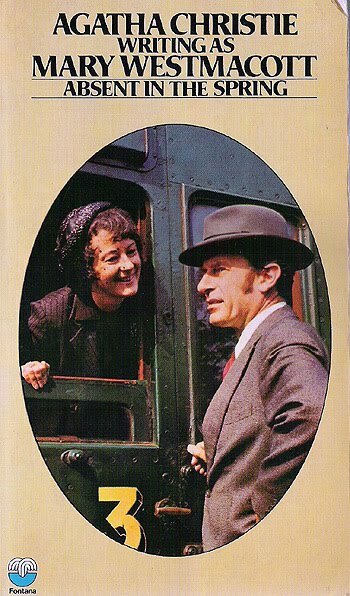 The leading lady of this novel is Joan Scudamore , a well to do middle aged housewife who is always sure about everything in life .She liked to think that she had a head over her shoulder and so could take charge of everything and everyone .She also thought that she knows what is best for everyone around her including her family consisitng of her husband Rodney and three children. She was pleased with herself for having been a success - she never wanted a career , quite content to be a wife and a mother .She had married the man she loved and he was successful at his job owing to her ,a bit ( her thoughts ) and she knew she could always influence people around her and mighty proud with it . Now , Returning from a visit to her daughter who lived in Baghdad with her husband and baby son , she finds herself unexpectedly stranded alone in an isolated guest house.The reason being the delay in clearing the railway tracks which had got submerged due to flooding as it always happens in that part of the world. Just when she is feeling a gentle glow about her own well kept image she happens to see an old friend of hers who looked at least sixty , while she was actually only forty eight looking untidy wearing some extra ordinary clothes which made her look even worse..
Joan being left alone with just a couple of people who ran the guest house, having nothing much to do is forced to think back on her life.This process brings out many facets of her life and since she was doing such an exercise for the first time in she begins to face many unpleasant truths about herself. As she begins re-examining and scrutinising her past actions , her relationships and attitudes , she also becomes uneasy about what is being revelaed about her as a person. Her self discovery takes her through her present and past life and her relationships with her family and friendsHer life before her marriage and her often dominating relationship with her husband and children make her uncomfortable as she begins to view things differently . She begins to wonder whether her life was really as perfect as she thought it was or was it her own illusion ? more importantly how did other people who mattered to her, visualise her and her actions ? Agatha Christie is supposed to have remarked - " this is one book that has satisfied me completely - the book I always want to write " . I totally agree with her on that, this is without doubt one of her best novels ever.The painful and often unpleasnat findings that Joan has to face about her past life is sketched with complete understanding of human nature and their natural reactions to such adversities in life.The concept is simple here but the narrative is superb, keeping the reader interested throughout. One can almost feel sorry for her when Joan begins to go deeper into her past life and begins to unearth more skeletons from her past and also begins to face some difficult truths about herself .But human nature is such that no matter what, the basic instincts survive and take over after the initial reaction gets diluted. Most human beings recall happy events without any guilt but when it comes to other events not that straight forward or have some disturbing elements in them , many tend to overlook them and try not to think about them unless one is forced to do so.This is exactly what is happening with Joan since she has time on hand and also met an old friend who has successfully shaken her self confidence and feel good factor ,has been the cause of bringing out all those memories that were best kept hidden or was it that Joan never really bothered to understand people who mattered to her because she was too busy congratulating herself and her gentle manipulations ..
To be honest, this novel makes one introspect about one's own life and deeds, it did to me . One can call it an exploration of a woman's inner life not just women but an individuals inner life .It can be quite unsettling for readers since we too begin to have doubts as to how others see us ? An excellent book that has the usual unexpected twist and a surprising end .The suspenseful drama very much a part of Christies novels and the unexpected happens here too ! A must read for all Agatha Christie fans.